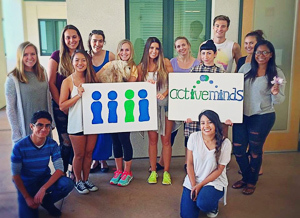 Active Minds is a student organization that is “changing the conversation about mental health.” There are many Active Minds chapters all over the United States. All you have to do to join the organization is show up to our meetings, which are held from 1:00-2:00 on Thursdays in Conference Room #3 on the 4th floor of the Calpulli Center. Stop by, help reduce the stigma around mental health, and learn about current trends in the mental health field. Please note that some Thursdays you may see us out outreach events around campus (in our bright green shirts), in which case there will be no meeting that day. To join, all you have to do is show up! We hope to see you there.